There are mainly 2 types of diabetes. Type 1 diabetes (previously known as insulin-dependent, juvenile or childhood-onset) is characterized by deficient insulin production and requires daily administration of insulin. The cause of type 1 diabetes is not known and it is not preventable with current knowledge. Symptoms include excessive excretion of urine (polyuria), thirst (polydipsia), constant hunger, weight loss, vision changes, and fatigue. These symptoms may occur suddenly. Due to a host of factors, the number of people living with diabetes is projected to rise sharply. An unhealthy diet coupled with a lack of physical activity is the most important driver. In many countries around the world, recent changes in lifestyle have led to a significant increase in the prevalence of diabetes. 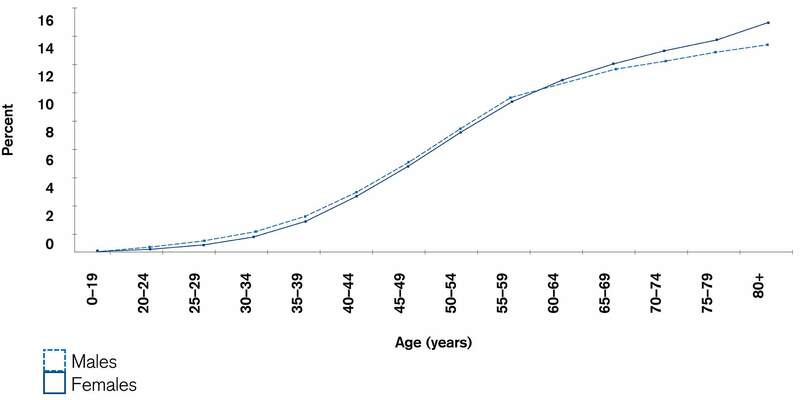 Diabetes is also, very markedly, an age related disease. Although diet and exercise – and as a resulting factor weight – play an important role, demographic aging will lead to a much larger diabetes population in the future. 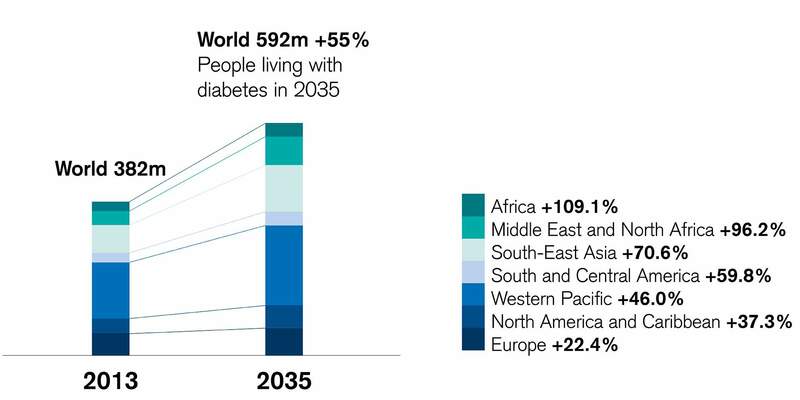 Some areas around the world will be hit simultaneously by both factors: Their population has adopted a lifestyle that leads to a higher prevalence of diabetes, and this is exacerbated by a faster demographic transformation process. Insulin management yes – but…. For all type 1 diabetic patients, blood sugar level control through insulin management is a necessity. For type 2 patients, there is usually a host of measures that can be used to control blood sugar. It starts with diet and exercise and involves different oral medications (Metformin, DPP4-inhibitors, SGLT2 inhibitors). However, at some point adequate blood sugar control can only be obtained by regular insulin administration. Without the help of technology, insulin management can be complicated: It involves several finger pricks per day, calculation of the optimal combination of long- and short-acting insulin, and finally insulin administration by syringe or pen. Given the fact diabetes is a chronic condition, and patient compliance for chronic conditions is generally not perfect (understandably so because of the high prevalence at a later age), there is a growing number of patients who need insulin administration but are looking for easier solutions that help them keep their blood sugar level within an acceptable range. Not too high – which causes all types of follow-on diseases (eye diseases, diabetic foot etc. ), but also not too low (which causes a hypoglycemic event where the patient loses consciousness and often qualifies as a medical emergency). A technology that simplifies the whole process of blood sugar measurement, insulin calculation, and insulin administration (in other words diabetes management) can be a very effective tool to prevent these blood sugar excursions – which will greatly diminish follow on costs for the healthcare system as these patients have less diseases caused by a poor blood sugar control, and less hospitalizations due to hypoglycemic emergencies are necessary. How can technology help with the management of the chronic diabetes condition? It has been a long lasting medical dream to establish a closed loop system that would perfectly mirror the way the natural pancreas works. Although today, such a system is not fully autonomous yet, a lot of progress in this direction has been made over the past couple of years. Often, already nowadays such a system is referred to as an “artificial pancreas”. The different elements of the “artificial pancreas” are all critical, and for all the elements significant progress has been made. Starting with the continuous glucose monitoring sensor, its accuracy is crucial as the cascade of algorithms and resulting actions (insulin administration, alarm functions) is based on its readings. The devices have to have a reliable interconnection. Algorithms themselves are hard to develop as they have to adjust to many situations and should be learning from the behavioral pattern of the patient to come up with better predictions. Finally, the insulin pump should be very small and extremely resistant (water, shock, etc.). Over time, each system generation will have incremental benefits: More accurate blood glucose measurement, better trend prediction, less false alarms, insulin switch-off function to prevent a dangerous hypoglycemic event, more data capture capabilities, and the possibility to send alarms elsewhere (to caregivers, parents, etc.). The cost implications of diabetes are huge. Over the long term, a very good insulin management can cut those costs dramatically and has the potential to lower the overall costs. In the US, about 15% of the healthcare spending is tied to the treatment of diabetes. Of course, a mere focus on the cost side would not take into account the many losses and lives changed due to the dire consequences of an inadequate blood sugar control: In the US alone, on an average day, 295 Americans have to undergo an amputation! 20 years ago, the dream of creating a fully closed loop for the treatment of diabetes was already alive but a futuristic idea. It is only with recent technological advances that such a system could make meaningful progress. However, it is only a step in the right direction and more work is needed to create a fully automated solution. A more and more accurate constant glucose monitoring sensor, sophisticated algorithms in conjunction with the ability to capture data and send out alarms was a pre-condition for such an integrated system. Not to forget the insulin pumps which used to be bulky devices that had to be manually told how much insulin to administer. The progress already made can in many cases greatly benefit the patient and increase the quality of life. Also, by avoiding a lot of follow on costs and hospitalizations, the healthcare system can even save money despite the additional cost of the tool. At Credit Suisse, we believe in this long-term opportunity. We have therefore designed a strategy to give investors exposure to the theme of technology revolutionizing diabetes management, within the broader context of digital health. Equities are subject to market forces and hence fluctuations in value, which are not entirely predictable. Investments in foreign currencies involve the additional risk that the foreign currency might lose value against the investor's reference currency. Emerging market investments usually result in higher risks such as political, economic, credit, exchange rate, market liquidity, legal, settlement, market, shareholder and creditor risks. Emerging markets are located in countries that possess one or more of the following characteristics: a certain degree of political instability, relatively unpredictable financial markets and economic growth patterns, a financial market that is still at the development stage or a weak economy. The funds are domiciled in Luxembourg. The representative in Switzerland is Credit Suisse Funds AG, Zurich. The paying agent in Switzerland is Credit Suisse (Switzerland) Ltd, Zurich. The prospectus, the simplified prospectus and/or the Key Investor Information Document (KIID) and the annual and half-yearly reports may be obtained free of charge from the representative or from any branch of Credit Suisse (Switzerland) Ltd in Switzerland. Your Personal Data will be processed in accordance with the Credit Suisse privacy statement accessible at your domicile through the official Credit Suisse website https://www.credit-suisse.com. In order to provide you with marketing materials concerning our products and services, Credit Suisse Group AG and its subsidiaries may process your basic Personal Data (i.e. contact details such as name, e-mail address) until you notify us that you no longer wish to receive them. You can opt-out from receiving these materials at any time by informing your Relationship Manager.